Found via Bubbledog: Jellio makes products, like the Rubik's Cube stuff I linked to earlier, that's inspired by toys and treats of our childhood era. 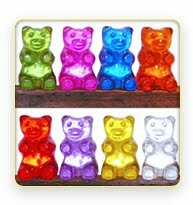 These Gummi Bear Lights are pricey, but adorable. These monkey mirrors are reminiscent of Barrel of Monkeys. This bench is decorated with candy buttons that look real enough to gnaw. Gumball machine clocks that really dispense prizes!